NP HMI is a very widely used series of Omron HMI along with the NT series. NP HMI has many functions and features like you can transfer your Program from NP HMI to PC or PC to HMI by USB Pen Drive. Other function of NP is that you can use Macro in this HMI which can reduce PLC programming to some extend. In this tutorial we will learn how to Use Macro's in NP HMI or Any HMI Supporting Macro function like NT, NS, NQ etc. You will find that Macro are very helpful in our PLC programming. Subscribe to Automation-Talk by Email. Macro are set of Instructions which are used in HMI as a special functions which helps in performing special task while entering into the HMI Screen or leaving the screen. The two macro which are used in HMI are start Macro and End macro. Suppose you want to make a internal PLC bit or any other bit of the PLC to be in ON or Off condition when you are in any screen of the HMI. This can be done by PLC programing and making a bit ON or Off and you can also do this by using Macro in your HMI. Now to put start or End macro in your HMI program just follow below steps. 1.Click on Start Macro to start the initialization of your macro commands. The start macro will bring you the Macro program writing screen as shown below. 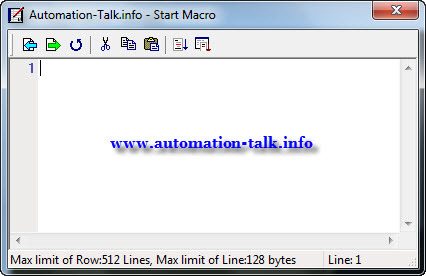 The maximum limit of Row of Macro is 512 lines and maximum limit of lines is 128 bytes. 2.Now Just write your Macro in the macro programing space. If you don't know the macro programming then don't be upset just click on Macro Wizard which will bring you another screen where you can see all commands for your programming like arithmetic, logical, Data conversion, Data transfer, comparison, Flow control, Bit Setting, Comm Setting Etc. In this you can set up-to 4 variable for only 1 command which helps in educing your programming in PLC end. 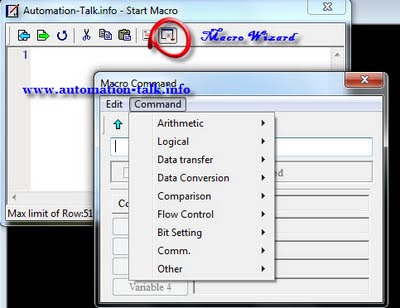 We will continue to post more NP HMI Tutorial on macro and help you in Macro function learning till then you can Subscribe to Automation-Talk by Email or keep visiting.